Plans to open up the majority of Clyde and Hebrides ferry routes to private competition have been delayed, BBC Scotland has learned. 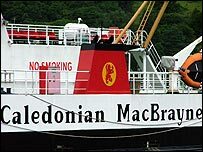 It comes after no bids were received for the first Caledonian MacBrayne route to be put out to tender. Meanwhile, Transport Minister Tavish Scott said the Scottish Executive has "nothing to fear" from a watchdogs' probe into the ferry tendering. Western Ferries has described the tendering process as biased and unfair. The firm said it may complain to public spending watchdog Audit Scotland. The Conservative transport spokesman David Davidson has also called for the auditor general, Robert Black, to investigate. The tendering exercise attracted no bidders for the west coast Gourock-Dunoon route when the deadline closed on Monday. Three firms were invited to put in a tender for operating the ferry route on a commercial basis. However, V Ships pulled out of the running in September. State-owned CalMac said it could not operate the service without a subsidy, and Western Ferries , which runs a rival ferry service to Dunoon, complained of late and inconsistent information from the executive. However, Mr Scott said he had "absolute confidence" in the process. He told BBC Radio Scotland: "I would welcome any Audit Scotland investigation into this matter, if that is what Western Ferries are now saying." The minister denied any unfairness. Mr Scott added: "We specifically sought to assist Western Ferries and the other companies considering bidding on this particular route, by helping them for examples with deadlines. "They are now criticising us for that - it doesn't seem they're ever particularly happy." Mr Scott said Audit Scotland had previously carried out an investigation into another ferry tendering exercise. "We have nothing to fear from that, if that's how they wish to take the matter forward," he said. "I have absolute confidence in the process that's been undertaken." Western Ferries has claimed that if a new operator was to replicate the current Gourock-Dunoon service, projected fares would treble just to break even. The SNP's Jim Mather, MSP for the Highlands and Islands, called on the executive to rethink the tendering process. He said: "There is a pattern here. "We've had no bids on the Campbeltown-Ballycastle ferry, a complete failure of the Northlink ferry services, we've had people withdraw for the west coast. "The executive has to get real about this." Mr Mather added that the Labour-Lib Dem coalition had "failed to level the playing field" in favour of west coast communities. "They are causing such inordinate delays that confidence in the area is being diminished," he said. Ministers are now expected to order a re-run of the tendering process, but this time on the basis of providing a subsidised service.